Notice of the establishment of a whale sanctuary in Walker May appeared in the Government Gazette of 29 May 2001. From 1 July 2001 no boats or crafts of any kind will be allowed in the Walker Bay Whale Sanctuary Marine Protected Area (A). The Sanctuary stretches from the Westcliff Beacon near the new harbour in Hermanus to the Gansbaai harbour. 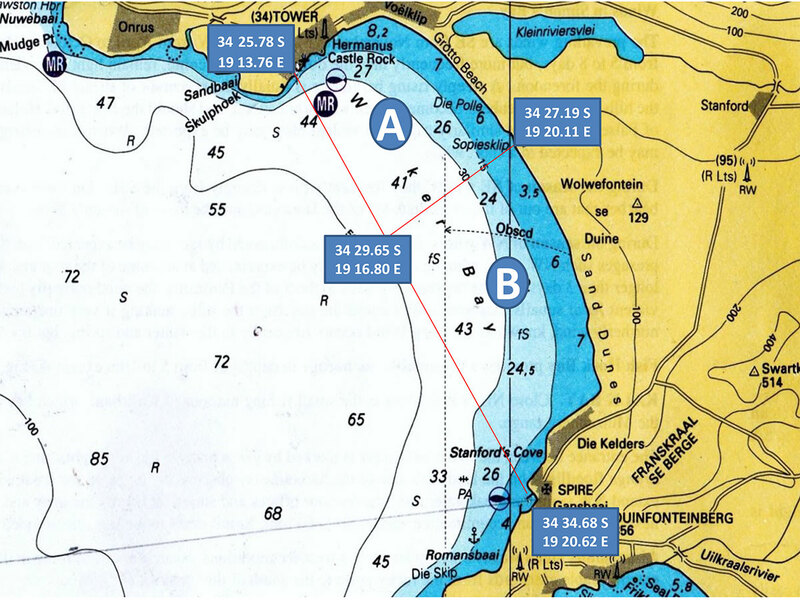 About half the area (B) may be used by authorised whale-watching boats, as well as authorised commercial and recreational fishermen. The regulation applies only from 1 July to 30 November in any one year. NOTE : Season is closed from September to end November inclusive. Galjoen (Dichistius capensis) – season closed from 15th October to the last day in February in the following year.Chokka squid (Loligo vulgaris reynaudii): – There is no closed season according to Gov Gazette No 35903 of 23 November 2012. However the DAFF brochure shows closed from 12h00 on 19 October to 12h00 on 23 November in any one year. Presumably this is a mistake. Elf/Shad (Pomatomus saltatrix) closed from 1 October to 30 November in any one year.